GEORGE TOWN - She was supposed to take her PT3 examination but when the alarm clock went off at 6am, her mother could not find her at their apartment in Bandar Sri Pinang in Jelutong. 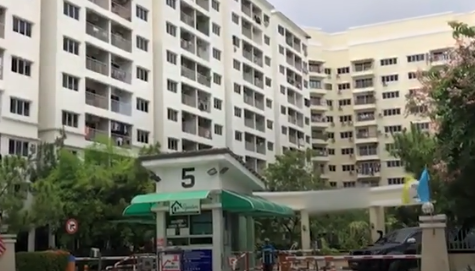 A cleaner later found the body of the 15-year-old student near the swimming pool on the ground floor yesterday morning. It is learnt that the girl had fallen to her death from her 11th floor unit in the wee hours. She left behind four notes - one each for her parents, friends, classmates and teachers. Her mother, who wished to be known as Lee, in her 40s, said the girl could have been suffering from exam stress and pressure. "She was shut-in and very quiet. "She always kept things to herself," said a teary-eyed Lee at the Penang Hospital mortuary yesterday. Lee said her daughter was nowhere to be found at 6am yesterday. "Her sister woke up and told us about it. We then went around to look for her," she added. The girl was the only absentee out of the 598 students of SMJK Heng Ee sitting for PT3. Principal Loo Soo Ping said the school was saddened by her demise. "We called her mother after realising that she was still not here at 7.20am. "We were shocked by her mother's revelation. "We are saddened by the incident," she said. The victim was an average student. Loo said they just conducted a counselling session for the students on Friday. "I told the students that this is just a personal assessment and wouldn't affect their chances of continuing Form Four. "I told them not to give themselves unnecessary pressure. "Even if there is, try to find a way to release the stress," she added. Loo said the school had even planned several activities for the students once the examination is over. George Town OCPD Asst Comm Che Zaimani Che Awang said they received a distress call at 8.45am that a girl had fallen to her death. "We believe she had fallen from the window in her bedroom. "The case has been classified as sudden death," he said.